Monk Fruit (Siraitia Grosvenorii) other names : Arhat Fruit , La Han Qua , Lo Han Kuo , Longevity Fruit , Luo Han Guo , Monk Fruit. Monk fruit (Siraitia grosvenorii) is native to the southern regions of China as well as the northern regions of Thailand. This is herbaceous perennial vine belonging to the Cucurbitaceae or gourd family. The monk fruit plant is grown for its sweet flavoured fruits. The extracts of monk fruit is almost 300 times sweeter compared to normal sugar. 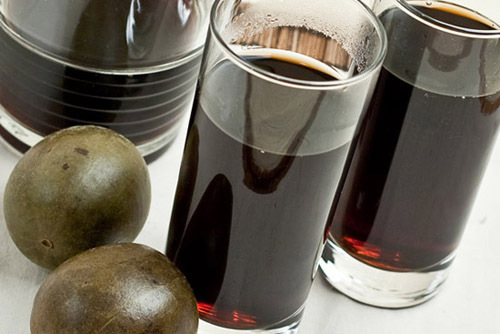 In China, people have been traditionally using Monk fruit in the form of a natural sweetener with low calorie content for preparing cooling beverages. 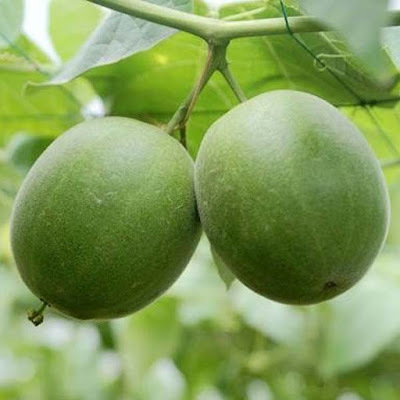 In addition, the fruit as well as its extract have been used in traditional Chinese medicine as a cure for diabetes and also to reduce obesity. 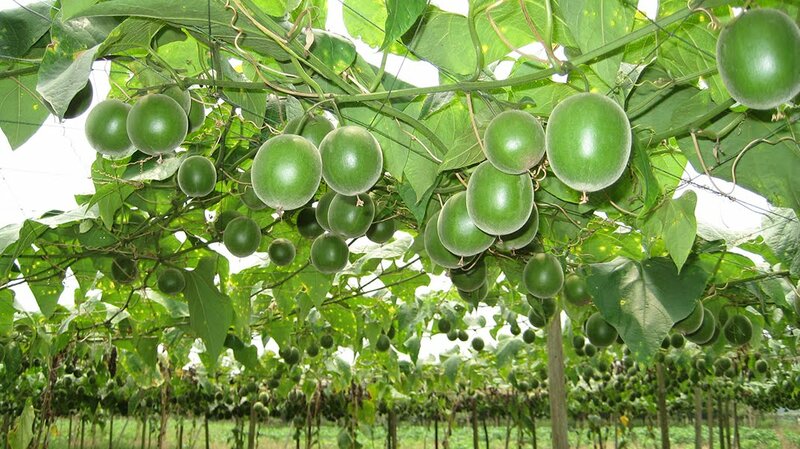 The monk fruit vine often reaches a length of anything between 3 meters and 5 meters. The vine climbs over neighbouring plants with the help of its tendrils that twine around everything they come in contact with. The leaves of monk fruit plant are slender, heart-shaped and grow up to a length of 10 cm to 20 cm. This herb bears round fruits that measure about 5 cm to 7 cm across. The fruits have a smooth texture and their color may vary from green-brownish to yellow-brownish. The fruits contain striations arising from the end of the fruit stem and have a tough, but thin skin that is swathed with fine hairs or bristles. The pulp of monk fruit is sweet and when dried out it develops into a slender, pale brown, fragile shell that is about 1 mm thick. The seeds of monk fruit are elongated and nearly rounded. Monk fruit is mainly found growing in Thailand and some regions of China, where people have been using it for several thousand years in the form of a food additive, for instance an artificial sweetener, and also for therapeutic purposes, especially for treating diabetes, obesity and other diseases. This is an exceptional fruit that is much sweeter compared to normal sugar. Monk fruit is rich in fructose and glucose content. However, the sweetness of Monk fruit is attributed to its unique glycosides that are present in high amounts in the fruit’s flesh. This aside, monk fruit contains loads of antioxidants and several vitamins and other organic compounds that offer us a variety of health benefits. At times, monk fruit is mistaken for purple mangosteen, which is in no way related to Siraitia grosvenorii. The flesh or pulp of monk fruit is consumed fresh, while its bitter rind is employed for making an herbal tea. Monk fruit plants can be propagated from their seeds, but the process is very slow as the seeds may take many months to germinate. Monk fruit is mainly grown in far southern Chinese province of Guangxi (primarily in the mountainous areas close to Guilin) and also in provinces like Guizhou, Guangdong, Jiangxi and Hunan. These mountains form an ideal habitat for these plants, because they not only provide them with the requisite shade, but they are also overspread by mist that helps to protect monk fruit vines from direct sun. However, the climatic conditions in this region of China are warm. Since the monk fruit is hardly found growing in the wild, Monk fruit has been cultivated for several centuries now. The monk fruit plants are valued for their sweet fruits, which are used both in the form of a sweetener and also for therapeutic purposes. Generally, monk fruits are sold in their dried form. Traditionally, people have been employing the sweet monk fruits to prepare herbal tea or soups. When something to which we are "allergic" is experienced by our body, mast cells of the body release several chemicals into our system. One such chemical is known as histamine, which is responsible for allergic reactions such as irritation, inflammation, coughing and other symptoms related to the condition. It has been established that the extract obtained from monk fruit is effective in preventing this particular activity of the mast cells, thereby reducing the release of histamine and doing away with common allergies. The monk fruit extract is also associated with lessening the symptoms related to asthma, thereby saving lives. While not many studies have been undertaken to ascertain the health benefits of monk fruit, findings of researches that focused on the impact of monk fruit on cancer cells were certainly remarkable. It has been found that this fruit is especially useful in dealing with skin cancer. The outstanding antioxidant attributes of saponins and glycosides present in monk fruit have the potential to stop carcinogenic cells from spreading. In fact, these natural compounds can also decrease the presence of cancerous cells by combating free radicals. However, it is strange that consuming too much sugar has been related to higher chances of developing cancer, but the complex sugars and glycosides present in monk fruit seem to have just the opposite effect. This aside, an exceptional statistic reveals that the average number of people aged over 100 years per capita is far high in the regions where monk fruit plants grow naturally. Precisely speaking, it has been found that people who use as well as consume monk fruit juice on a regular basis appear to have a longer life span. While this is apparently founded on population statistics, the antioxidant attributes of monk fruit certainly have an effect on the overall "breaking down" of our body as we grow older, making monk fruit a potent anti-aging remedy. The organic constituents of monk fruit also help to prevent oxidization of cholesterol, something that happens prior to the cholesterol amassing into plaque inside the arteries and other blood vessels. Hence, it is believed that monk fruit possesses the potential to reduce the chances of suffering a heart attack and strokes, by putting off the development of a cardiovascular condition known as atherosclerosis. As most of us are aware, diabetes is among the most common and dangerous diseases in contemporary times. When one suffers from this condition, his/ her body loses the ability to control the levels of glucose as well as insulin in the bloodstream. In fact, consumption of normal sugar has a very negative impact on diabetics. On the other hand, foods sweetened with monk fruit extract does not contribute to rising levels of blood sugar. Owing to this attribute of monk fruit, it is promoted extensively as a remedy or preventive measure for diabetes. Like diabetes, in several cases, intake of high sugar has also been associated with obesity. It has been found that many people not only find weight loss programs strenuous, but also challenging. Monk fruit may prove to be beneficial for such people, as extracts and supplements of Monk fruit offer a healthy and very sweet alternative. As a result, people taking monk fruit extract or supplement can lose extra weight and still enjoy the sweetness of the fruit. They do not require compromising the flavour and pleasure of eating. Monk fruit also encloses reasonable amounts of vitamin C - a vital vitamin for the overall health of the human body. In addition to encouraging the production of white blood cells (leukocytes) in our body, this vitamin is also necessary for collagen production. Collagen is needed by our body to create cells, blood vessels and muscle tissues. Monk fruit encloses special glycosides, which are precisely called mogrosides, have been associated with prevention of infections caused by viruses, counting the Epstein Barr virus. Monk fruit has been widely used in Chinese herbal medicine in the form of a "cooling" agent. Monk fruit has been added to a variety of beverages as well as therapeutic formulations. For instance, people suffering from heat stroke, fever and joint inflammations will find the anti-inflammatory attributes of monk fruit beneficial, as they help to do away with these afflictions when the juice extracted from monk fruit is diluted with water and consumed directly. Similar to several other herbal remedies, even the use of monk fruit is said to be safe for most people, as there has been no cases of adverse side effects after using monk fruit. Nevertheless, like in the case of any food or plant group, monk fruit may cause unwanted side effects in some people. Luckily, monk fruit possesses anti-allergenic properties and, hence, it is unlikely that you experience such undesirable effects ever. Therefore, it is advisable that you consult a qualified medical professional or an herbalist before you start using monk fruit for therapeutic purposes. You should never add any new herbal remedy to your regimen without talking to them.